Medical - ZGL Engineering Service, Inc.
ZGL Engineering has chosen to partner with the Port-au-Prince, Haiti Medical Mission Trip sponsored by the Salem Baptist District Association of Colorado, the National Missionary Baptist Fellowship of Churches (NMBFC) and Community of Caring, International. 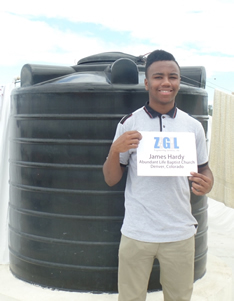 We are sponsoring a Water Storage Tank and Purification System, on behalf of James Hardy, Jr, a Junior Varsity player on Denver South High School Football Team. He is a member of Abundant Life Baptist Church in Denver under the leader ship of Rev Bill Rooks. Rev. Rooks and his wife Mrs. Betsy Rooks have over 20 years of combined foreign mission experience, serving in Africa and the Caribbean. This is James' first mission trip and he is looking forward to his experience abroad and working with the mobile clinic. James plans on having a career in Engineering and we plan to help him by mentoring and guidance as he make his career moves. Next January ZGL hopes to take a team of others and sponsor several more Water Storage Tank and Purification System. 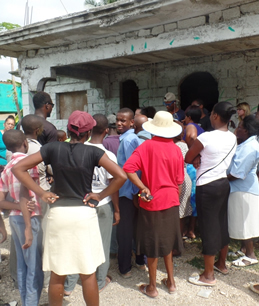 James has since returned home from his Medical Mission trip in Port-au-Prince, Haiti and back to his life as a teenager. 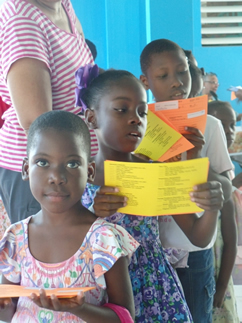 James' task was to give out Glasses, rice and beans. 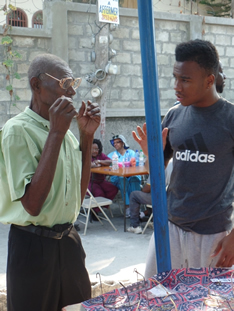 The best experience was passing out eye glasses and seeing the expressions on the older peoples' faces as they begin to see clearly. It was fun to watch the young girls pull out their mirrors to see how they looked. The people live in compounds with a wall surrounding it. In the compounds were 4 to 5 houses with multiple people living in them. The people dressed well and value their clothes. Clothing and other items are sold in the open market. Besides the people on the street, there was goats, pigs, chickens and stray dogs. Most of the transportation was walking, riding donkeys, motorcycles and there were a few cars. Their buses we actually cars made into buses. The weather was sunny for a couple of days, but mostly cloudy in between 70 and 80 degrees. "Church was nice, although I couldn't understand the language" James said. The Languages there are French and Creole. Haiti is having their first hotel built which opens March 1st. James stayed in a guest house for the missionaries. The food was great! Visiting the orphanage was an emotional event for James, he watched and heard the children sing "Our God is an awesome God". One of the young boys grew attached James and was speaking to him, but James didn't know what he was saying. The interpreter said he was saying "Can I ride home with you". James is thankful for his family and grateful for the experience. "Thank you ZGL for your donation on my behalf"